The United States Congress designated the Bristol Cliffs Wilderness (map) in 1975 and it now has a total of 3,750 acres. All of this wilderness is located in Vermont and is managed by the Forest Service. Bristol Cliffs, Vermont's smallest Wilderness, takes its name from the overhanging cliffs on the huge rocky slopes within the western portion of the area. From their 1,500-foot summit, you can gaze across Champlain Valley, over Lake Champlain, and into the Adirondacks of New York. A bulge of quartzite called Devil's Pulpit, probably used by early Native American toolmakers, dominates the cliff face. The face is considered unsafe for climbing. 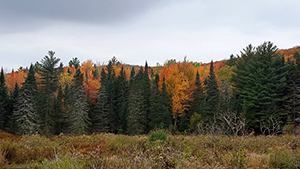 The forest of Bristol Cliffs provides habitat for beavers, white-tailed deer, black bears, and grouse. If you're lucky, you might spot a peregrine falcon on the cliffs. Two secluded ponds, North and Gilmore, are nestled deep in the interior. Numerous streams tumble musically over low waterfalls. The area has no established trails, and the occasional footpaths to the cliffs are faint and hard to follow. But with a map and compass in hand, you can explore the area and find one of the least visited spots in Vermont. Planning to Visit the Bristol Cliffs Wilderness? How to follow the seven standard Leave No Trace principles differs in different parts of the country (desert vs. Rocky Mountains). Click on any of the principles listed below to learn more about how they apply in the Bristol Cliffs Wilderness.